Human service programming has been the focus of much public scrutiny, legislative action, and applied research in recent years. As a result, human service providers have learned to exhibit greater respect for the needs and legal rights of their consumers, the appropriateness and cost- effectiveness of treatment procedures and service programs, and the per- sonnel and facilities involved in providing services to consumers. 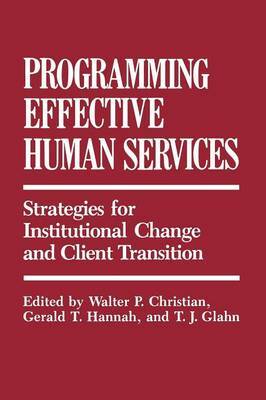 Despite this encouraging trend, many human service agencies are still trying unsuccessfully to meet the two fundamental criteria of effec- tive programming: (1) providing services that are effective in meeting the needs of the consumer and (2) equipping consumers to function indepen- dently of the human service system to the extent possible. For example, there appears to be a general acceptance of the notion that custodial institutional service programs are needed, despite the fact that they are ineffective in rehabilitating and transitioning clients to the community and that they are difficult to change. In addition, although community- based service programs have been developed as alternatives to institu- tional placement, there is rarely sufficient transitional planning and pro- gramming to facilitate the client's progress from the institution to the community. Although these problems generally are acknowledged, most human service managers and practitioners are ill equipped to deal with them. Specifically, the technology of human service management is in need of improvement. It is more theoretical than practical, and it lacks sufficient field testing and empirical validation.